Win a Kwiat Diamond Necklace! Chocolate and diamonds are a girl’s best friend and now you can have both this Valentine’s Day! 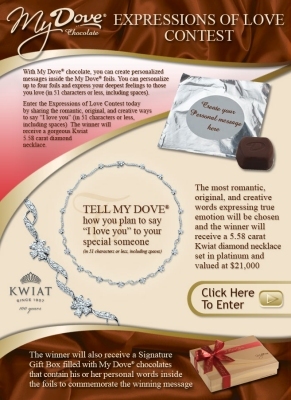 My Dove Chocolate and Kwiat Diamonds are having their first My Dove Expressions of Love contest where you can enter to win a $21,000 diamond necklace. Log on to MyDoveChocolate.com and enter how you plan to say “I love you” in 51 characters or less. The individual with the most romantic personal message will win a 5.58 ct. diamond necklace from Kwiat Diamonds and a luxury Signature Gift Box filled with their winning message printed on a personalized My Dove foil to commemorate the special message. Hurry, the contest ends March 15, 2008!